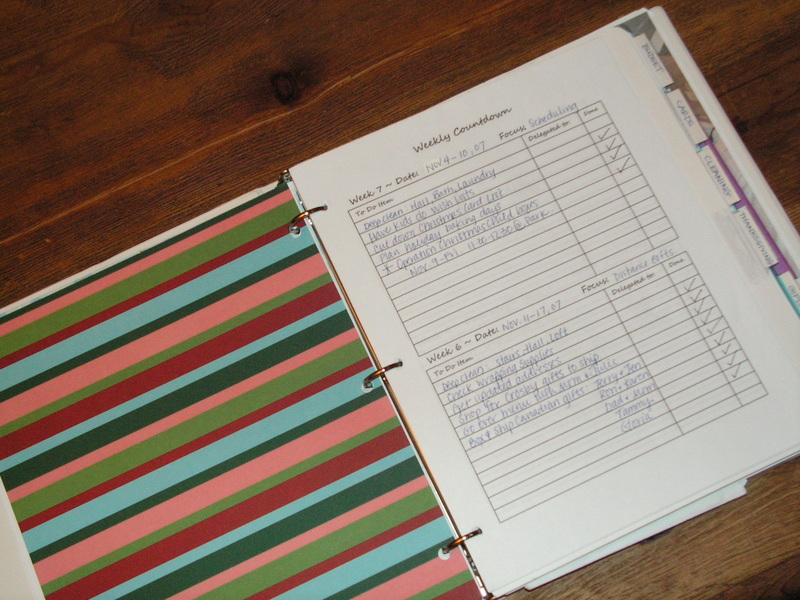 The book is pure organizational genius. 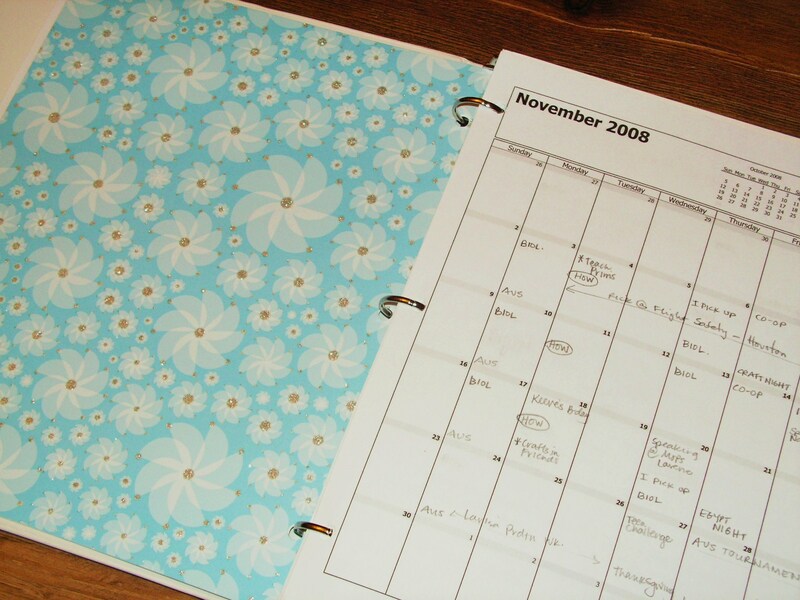 It starts with monthly calendar pages and moves through every area of holidaying: gifts, decorating, letters, cleaning, favorites, where you hid stuff for next Christmas, etc. Of course I decorated mine in wintry blues… my favorite colors that remind me of cold Canadian nights in the snow. 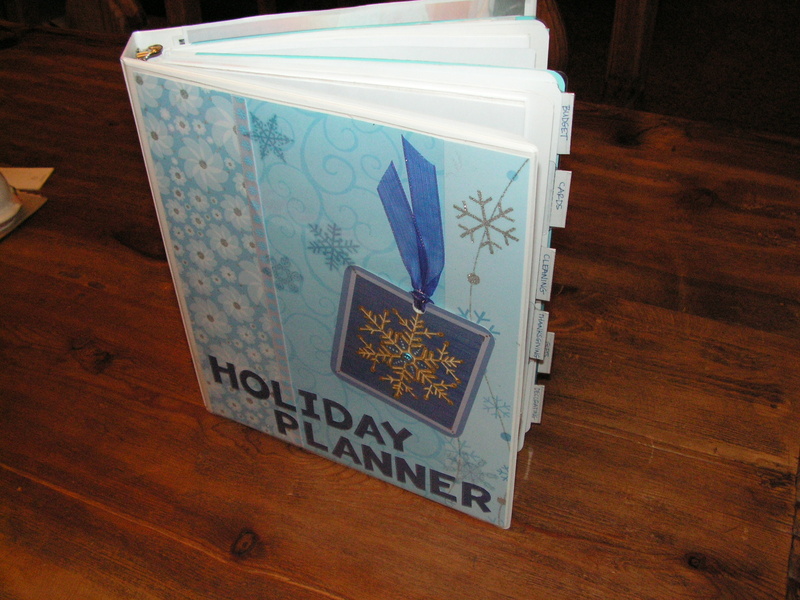 Last year was my first chance using the planner for the months of November and December and it was the first year in 20 years of marriage that we shipped Christmas gifts to the Canadian relatives ON TIME! No extra postage because of procrastinating! Wooo Hooo! The Deep Cleaning page strikes fear in the hearts of my children. But, boy howdy, does the house look better during Jesus’ birthday. 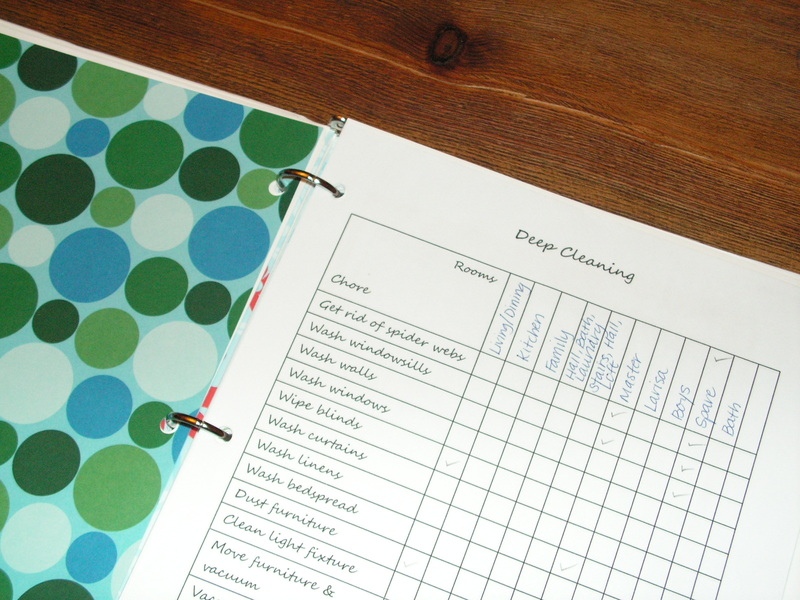 It lists every cleaning job possible and then every single room and hallway in the house. Sweet sanitary music to my ears. You only do one or two rooms per week and it doesn’t even seem that bad, especially when an energetic mother and her three willing assistants attack the room simultaneously. Ten to fifteen minutes per room… and the disgusting horizontal blinds even shine. 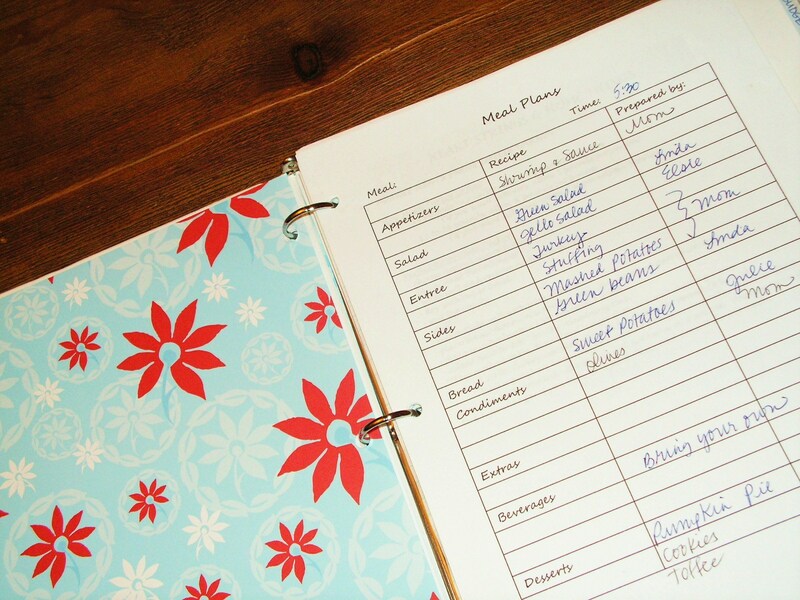 The meal and baking planning sheets were a Godsend come grocery shopping time. You just can’t put a price on the value of preparing ahead. It also adds peace of mind to the season that can be so stressful. 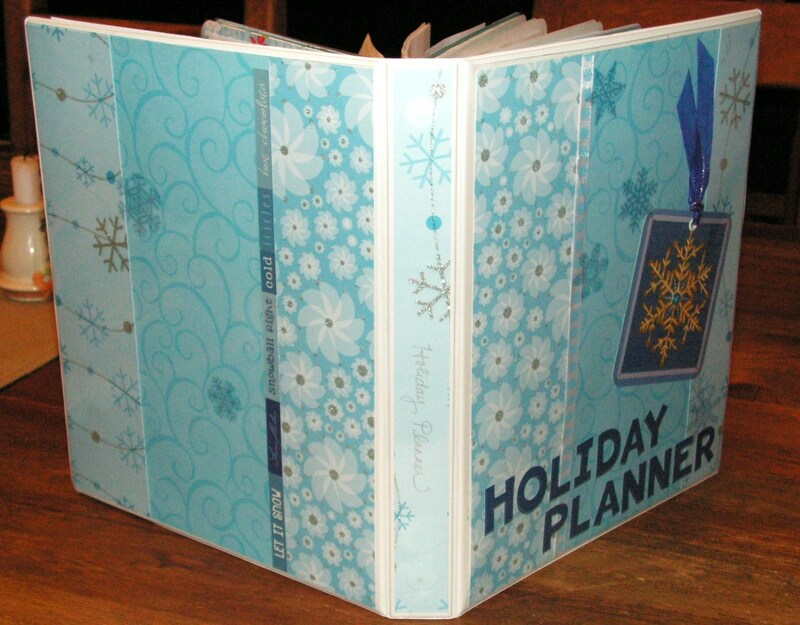 I used a plain white binder and slid in the cutesy covers with silver glitter. For those industrious fellow crafters and planners, here is the complete list of tabs: calendar, planner (weekly countdown of to-do lists), Thanksgiving (meal plans and recipes), cleaning, cards (sent/received lists and copies of past family letters), budget, decorating (magazine pictures, ideas from websites, lists of per-room decorations), gifts (planner with immediate family, extended family, friends, Wish lists, Gift Wrap Center, Gift Closet Stocking Stuffers, After Christmas Purchases and where I put them), food (meal plans, Baking planner, recipes), crafts (gifts to make, magazine ideas), wardrobe (A slot for each family members’ outfits: Sunday, Family Photo and Casual), Shopping Lists, and extras (lists of Christmas Favorite movies, books, music and Traveling checklists). I’m supposed to be cleaning my house. We have a family of ten coming over tonight for dinner. I’m drawn to things that don’t need to be done… and turn my head from those things calling me names. Names like “Miss. Piggy” and “messy” and “bad housekeeper” and “disgraceful.” That last one is ultra-applicable as my mother’s name is Grace and she’s a clean freak. Sorry, Mom. Why, oh why, did we choose horizontal dust-magnet blinds for every single blinkin’ window in this house? It seems like they are always covered with a layer of fuzz… even the day after I clean them. I need to market my phenomenal wonder of an idea…. flocked blinds. They will be delivered to your door with a layer of decorative fuzziness already on them… and they’ll always look clean. Can’t you just hear the sales pitch??? “And these flocked blinds NEVER need cleaning!” It will be a QVC smashing hit. I’m sure of it. And baseboards. It was a man who invented baseboards because he couldn’t cut straight lines in the sheet-rock to have it line up with the flooring…. creating yet another cleaning opportunity for the woman in his life. Once upon a time, my baseboards were really and truly white. Now they’re the color of almost chocolate milk… like when the Quick ran out too soon. The plethora of engaging items drawing my attention away from cleaning are unbelievable. The weeds grew overnight. They need to be pulled NOW. I know our guests will already have assumptions about my housekeeping, but my yard could be my excuse if it is weeded. But it’s 107 degrees and it’s not even noon. Weeding will have to wait until wintertime. The boys have built a blanket fort using 4 mattresses, Zaza’s purple canopy bed and all the sheets from the linen closet. I asked them to put it all away before our guests arrive. They looked at me like I had a third eye in the middle of my forehead. “We built the fort to play in with THEM!” Oh. Well, I won’t have to vacuum that room. Maybe I could throw the load of dirty sheets in there too… and eliminate one load of laundry. Maybe I simply need to get some matching pink cleaning supplies. Then I’ll want to clean the house.